I’m a big advocate of small house living and I think the benefits far outweigh the inconveniences that come along with it. My family and I live in 1000 square feet even though our family is still growing. A big reason we’re able to make it work is because we purged our belongings ruthlessly and then got creative with organizing what was left. 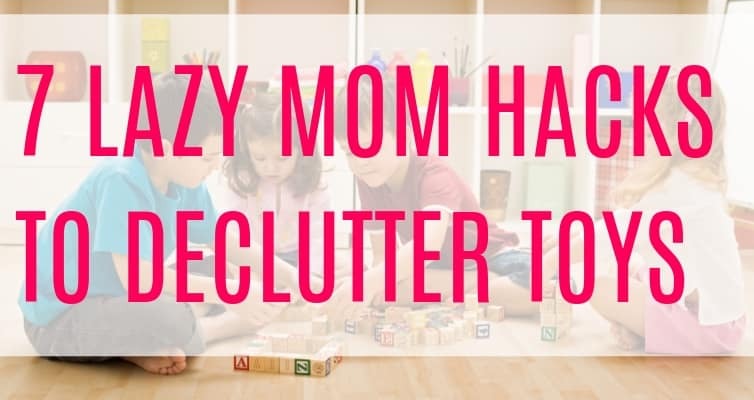 I can’t say enough about getting organized, decluttering, and regaining control of your space and life! 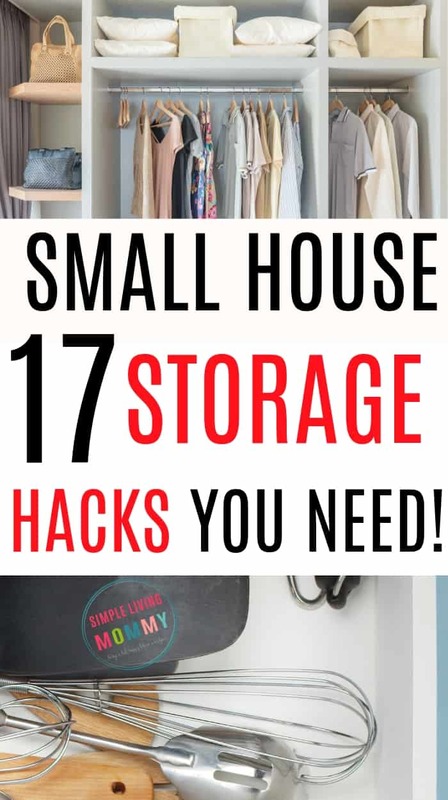 These small house storage ideas are what work for us and I’m confident they can completely change your life too. First, let’s get this out of the way. Spending a ton of money on storage and organization isn’t the solution. If you DO need organizing things for your home, check out these cheap options instead. I highly recommend going through your things and donating, selling, or throwing away everything you don’t absolutely love or use on a regular basis. Rethink the things you feel a need to keep. Are you only keeping these things because you think you might use them someday? Or because you think you know someone who can use them that you’d like to give them to? If you haven’t used the item in the last 6 months, give yourself permission to get rid of it – but do so immediately. Don’t keep things for the “what if” moments that will probably never come. One thing that I truly believe is that things have a way of finding us when we need them. 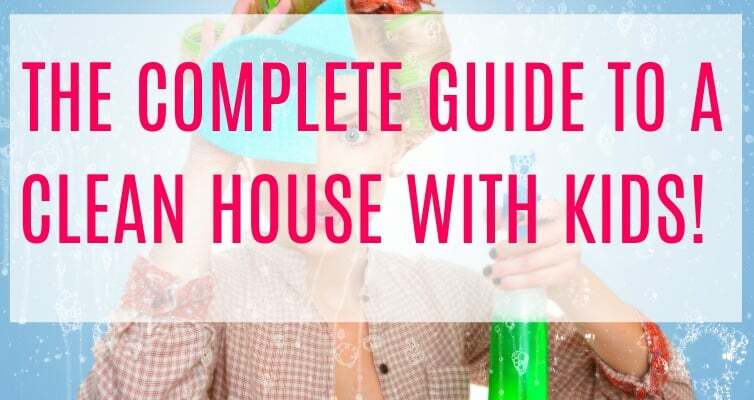 For example, if you get rid of an extra table that’s just taking up room in your garage because you want to use it when you move into a bigger house, allow yourself to get rid of it. One day, when you have the space and the need for a table like that, it will find you. I know how hippy dippy that sounds, but I can’t tell you how many times I wanted something and was able to find it extremely cheap at a yard sale. Very rarely do you get rid of something that can’t be replaced. Our kitchen is actually pretty big in our house, but that just means it takes up a ton of unnecessary space in our 1000 square feet. We have tons of cabinets, but they get used for extra storage for other parts of the house – plus they’re our only food storage. We’ve picked up one of these slim shelves that fits comfortably between our fridge and wall. It’s made such a huge difference in our search for storage ideas for our small kitchen. These awesome wire racks have doubled our cabinet space! I’ve picked up some of these from the Dollar Tree, but they’re flimsier than the ones I’ve purchased on Amazon. I can trust these ones to not shift and shatter my coffee mugs and saucers that I keep on them. One of the biggest issues in a small house is finding storage ideas for small bedrooms. We need space to put our clothes, sentimental items, and tons of other things in bedrooms. Bedrooms hold more of our stuff than any other room in the house. A huge source of extra storage space for us is under the two beds we have in our house. We put both of the beds on risers. This is where we store extra diapers, out of season clothes, our picnic basket and blanket, extra blankets, and toys the kids have yet to grow into. Bed risers like these literally give you storage out of thin air. 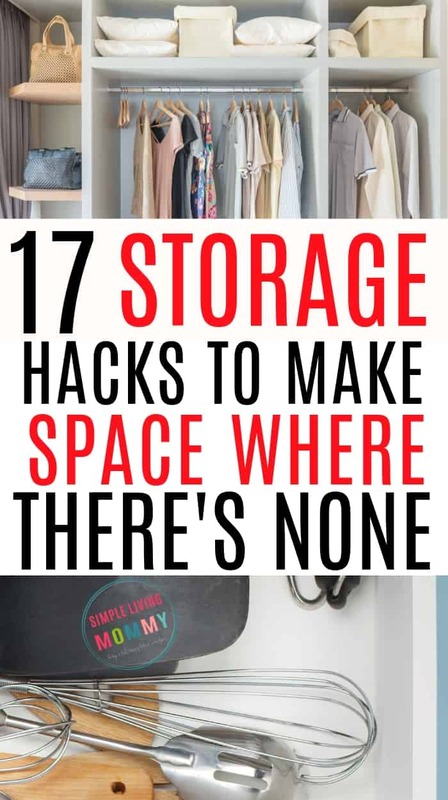 You don’t have to sacrifice anything to gain that space and you instantly get more storage without adding any clutter. It’s no secret that we LOVE the Dollar Tree and find our storage solutions there whenever possible. We have an addiction to their vacuum bags and use them to store all of our clothes, blankets, throw pillows, baby clothes, you name it. If we think we can vacuum seal it, we try it. If we want really sturdy, high-quality vacuum bags that will last, we pick them up on Amazon. We’ve even started to use these ones that don’t require a vacuum when we travel! This is how we organize all of our baby clothes and have created a rotating system to keep our kids’ clothes organized. It’s also the perfect way to maximize under the bed storage. We vacuum seal everything and are able to fit twice as much under there. If you haven’t given these bags a try, what are you waiting for?! You can put these hanging storage organizers on the back of any door in your bedroom. We use them on the closet doors to minimize the cluttered appearance of the room. These things are probably the biggest storage hack we’ve found in our search for storage in a small home with kids! Ours doubles as our coffee table with a simple tray we keep on top. It doubles as extra seating space when we have company. It acts as our toy box. I seriously can’t say enough about our storage ottoman. If you purchase nothing else when you’re stressed out and looking for small home storage space, pick up one (or more!) of these things! To make space in our living room for cords and other necessities, we bought paper sleeves like these to keep all of our DVDs in, and threw out the DVD cases. This simple change was so cheap and freed up probably 60% more space. We haven’t missed the cases and we can now easily fit all of our controllers and other electronics in the only two drawers in our TV stand. This keeps them away from our toddler and gave us all the storage space we needed with some left over. This has been my biggest issue with our house. We only have one bathroom and it’s TINY. My best solution so far has been to put this storage unit in our overly-sized kitchen. We had tons of wasted floor space, so adding this to the space made sense. I keep all of our extra soaps and towels inside. With such a tiny bathroom, we had to minimize our bathroom clutter. One of the best ways we did this was to get rid of tons of our towels. I either donated them or kept the rattier ones for rags. Now, we have only two towels per person. I keep one per person hanging on hooks just like these on the back of our bathroom door. Since you can’t make extra floor space in your home without costly renovations, there’s nowhere to go but up. Hang things and make use of space you might not think about, like the inside of your cabinet doors. If you’re strapped for space, this area can be a great place to hang measuring cups and spoons, utensils, and even spices. Your backsplash can be a great place for these extras too. As long as you keep like items together and minimize what you store in visible places, you can use places like your backsplash or under your cabinets for storage without making your kitchen look cluttered. Make use of all vertical space that you possibly can. Incorporate hangers into your closets and hang things like mops and brooms in your storage closet and hats and jackets on the back of closet doors. We keep a mail organizer hanging by our front door and use it for incoming and outgoing mail. It’s been a huge lifesaver. You might not realize how many things you’re holding onto that you don’t even pay attention to. Do you have more than one stapler? How many spatulas do you have? Do you really need as many scissors, socks, shoes, sheets, etc. as you have in your home? The kitchen is notorious for duplicate items. Go through and get rid of that stuff! Even pots and pans. How many stock pots do you need? I bet you don’t use all of those things at once, so purge them and move on. Then you’ll have tons of free space for the items you actually use and love. You’d be amazed at how much space you can free up just by getting rid of duplicate items. This also simultaneously declutters your home. Plus, those items can be sold or donated to someone else who can really use them. Another great way to find storage space in the kitchen is to get rid of all of your boxed and packaged items. In our house, we cut the instructions off of any boxed food and store the food itself in bins in our cabinets. We do this for freezer items too. We love frozen vegetarian prepared meals (it’s kind of our guilty pleasure), but the boxes take up too much space in the freezer. We simply cut the instructions off of the boxes when we get home from the grocery store, throw away the rest of the box, and store the food in the freezer. Then we keep all of the cooking instructions in a drawer. It takes up so much less room! Use layers to take advantage of the storage space you have. We have very little storage space in our bathroom, so we store everything in plastic shoebox bins with lids that can be neatly stored. We use plastic Sterilite drawers in our closets for small clothing items like socks, underwear, and bras to make the most of closet space and free up storage in our dresser. If you’re really short on space like we are (we live in just 1000 square feet after all!) sometimes where you store things isn’t going to make perfect sense and that’s okay! We have hardly any bathroom storage space, so our towels are stored in a second closet that’s in our kids’ room. Is it perfect? No, but it works for us! Where you are able to find storage might not make perfect sense for the item you’re trying to store, but if it works, it works. Don’t beat yourself up for having to store stockpiled food under the bed, for example. In our home, we live by the motto “a place for everything and everything in its place.” Even if the place doesn’t make sense to most people, if it’s giving your items a home, it’s solving part of your storage problem. 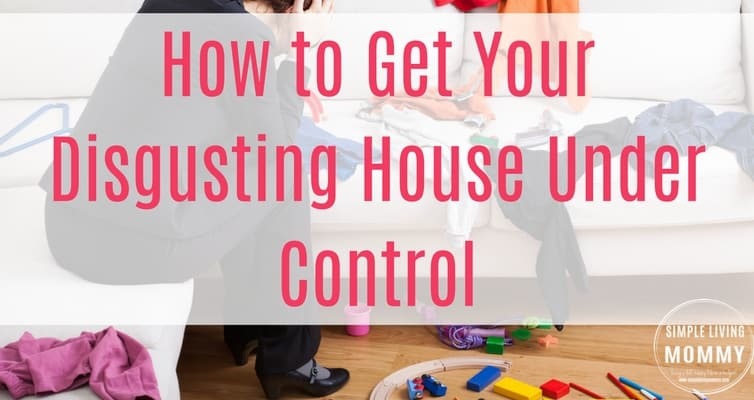 If you purge your home of everything you don’t use regularly and find a designated place for everything you decide to keep, your home will be more organized and your life will be simpler and less stressful. Hanging things, stacking, and getting creative with your storage solutions will help you find storage space in your home where there seems to be none. Do you have limited storage space? How do you solve your storage problem? What tips do you have for others in the same situation? Let me know in the comments! PS – Don’t forget to check out these amazing resources for getting organized and clearing clutter! I use baskets and trunks to store things as well. They can double as night stands or end tables. That’s a great idea, Marcy! Hi we use a plastic “letter basket” they’re magnetic on one side to store our instructions,recipes and coupons on the side of the fridge. Keeps them handy but off my very limited counterspace.